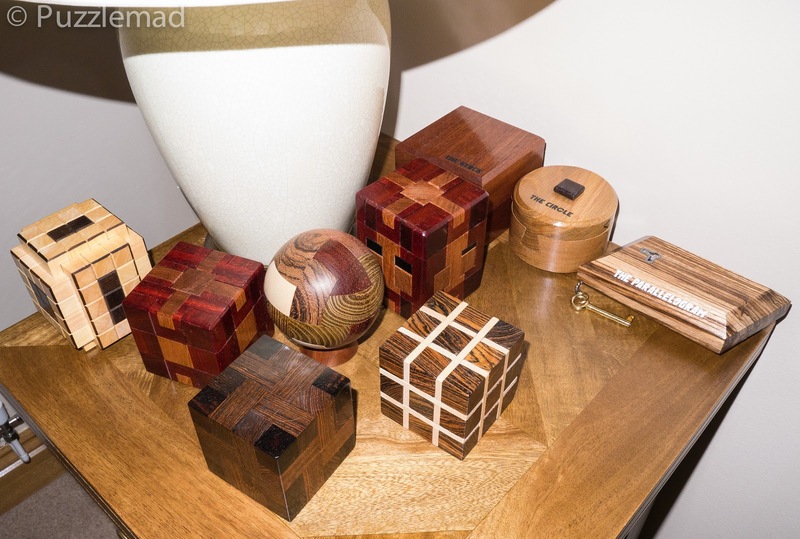 PuzzleMad: A great discovery.......or Shane does it again! Bottom view - he even provided a novel stand! On Friday I had an absolutely dreadful day at work and trudged home at the end of the day expecting to finish the day with a very well earned glass or 2 of something with noxious chemicals in it to make life seem more tolerable. I arrived home to find Mrs S looking hot and bothered due to the tremendous airless heat we have been suffering recently! She seems nowadays not to like the heat much but it was 38ºC in our conservatory and adjacent kitchen so I cannot blame her from being grumpy. After a bit of a chat about the day's shenanigans, I went into the kitchen to find an unexpected parcel! I had to vociferously deny all knowledge - I only have one thing currently in the post and do not expect it for another week! It's true - I promise - although someone special is due to post another something special to me tomorrow! Tearing open the package I find an envelope with an old fashioned seal on it and a wonderful new toy from Shane! This is the third in his series of puzzles and is even more beautiful than the previous 2! As before it has the name painted on it and on the reverse is his signature, my name and the serial number 001 - licensed to thrill! 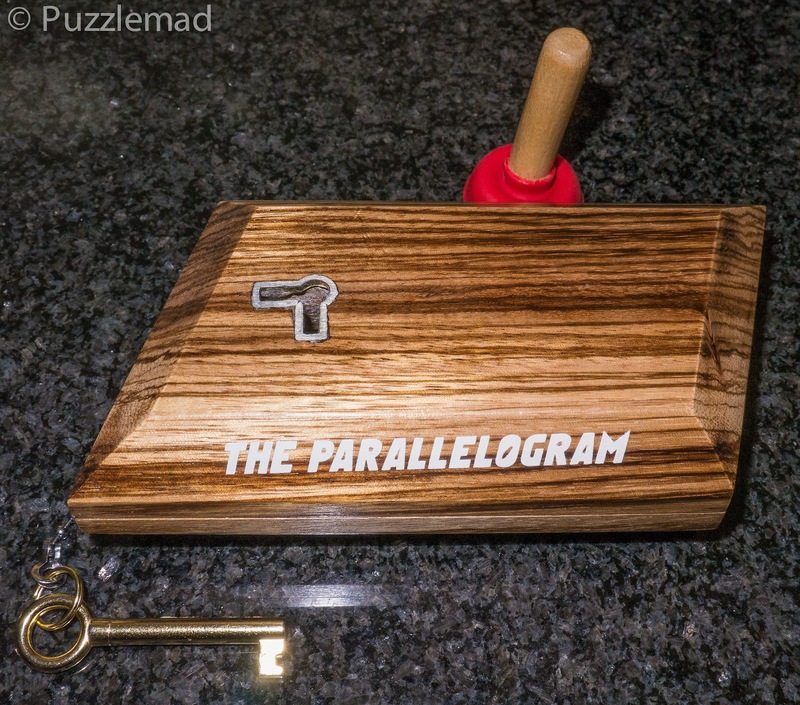 The theme of the shapes "The Block", and "The Circle" continue and this is delightfully named The Parallelogram. Breaking the seal on the envelope for my mission instructions, I am told that I need to "OPEN IT......." - very helpful. There's a little history too about his journey as a designer and craftsman, a mention of a future design yet to be made and the terms and conditions. Terms and conditions? Is there a contract? Well sort of! Let me explain..... I have had at least 10 emails over the last year or so asking how puzzlers can get one of Shane's puzzles and I have had to explain that they are not available and unless he changes his mind, they will NEVER be available. 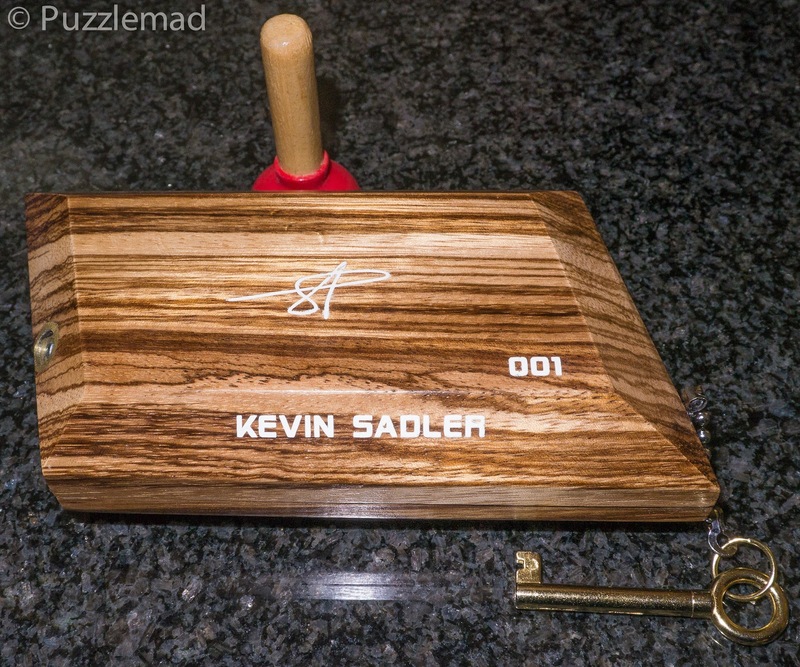 Shane makes only 4 of each puzzle, 000 is for his personal collection, 001 is for me and the other 2 are given away to people he considers deserving amongst the puzzle community - they have either helped him or done a lot for other puzzlers. I am lucky enough to take on the burden of helping with that decision and they have received a very wide audience as a result. Why do I always get number 1? I don't understand it myself but I am eternally grateful to him for it. Over the last couple of years we have journeyed together through quite a few very tough puzzles and have done tandem solves on some of the toughest and "funnest" (is that a word? it is now!) puzzles ever made. We love doing them together and communicate a lot in the process. Nevertheless, I think I gain the most from our friendship but please don't tell him that! "This puzzle is a gift, the rules are that it can never be sold, exchanged or even given away. It MUST stay in your collection or be returned to myself." Well, I cannot argue with that and I would never dream of letting them go - there is far too much emotional value in such a gift - I owe him much more than that! In fact these are so special that they are not just kept on show amongst my embarrassingly large collection, they are beautiful enough to remain one of the few puzzles on show in my living room - even Mrs S likes them enough for that and she's a very choosy wife (except in her choice of husband)! After emailing my thanks and some initial questions, I sit down to have a little play. Now we see the healing power of puzzles because my need for large quantities of booze had gone and Mrs S was being civil to me again! I did what you do with every puzzle that comes with a key - you HAVE to put it in the keyhole and give it a turn and, as with almost all of them, there's a clicking noise and nothing at all happens! Hmmm! After trying the same thing in multiple orientations and in motion too, it is time to make dinner and be nice to "her". That evening, whilst sitting in front of the TV, I continue to play and get absolutely nowhere but do have some good thoughts! A few more emails are exchanged and then it is definitely time for bed - having spent the last few years surviving on 4 hours (or less) sleep per night, I flag badly by 11pm! No! it's not constant thoughts of puzzles that keep me awake! Saturday morning was sweltering hot and in my south facing garden, I decided that I'd get sunstroke or malaria if I went out to trim things! Yep it was puzzle time again. Hooray! Some more emails went back and forth and I received a clue from Shane simultaneously with finding the first step. Yes, this is a multi stage discovery puzzle - it's not yet like the amazing masterpieces from Wil or Brian Young but it won't be long before Shane reaches that level. The next step proceeded easily and then a major discovery occurred - but it needed a little force and I wasn't sure about that. Another email to check that all was ok and then I needed some thought, some peeking into a small dark crevasse and then some careful fiddling and..... I had opened it! The mechanism is totally unique - I am not aware of anyone else using the same idea and inside was a little prize! A very small prize indeed - Brits of a certain age will be pleased to see it. 2 halves and the stand in use now! It was probably less difficult than The Circle but required no dexterity and because of the discovery elements I found it much more enjoyable. On top of that, it is great to see his craftsman skills improve as well has his design skills - I know that he is a master craftsman because I have seen his certificate to prove it, as well as a very young (and thin) looking photo of him receiving said certificate which I will not publish to prevent embarrassment. Similar to puzzles from Wil, the reverse engineering of what was happening was all part of the enjoyment of the experience. If Shane continues like this, he will soon be a force to be reckoned with in the puzzle design world. I will be bringing it with me to the MPP next weekend and will also take it to the IPP the following week. The whole puzzling world needs to see these! Thank you mate, I am very privileged to receive these and they will take pride of place in my Living room. I think they stand up well amongst the best of the best! I plan to have a special large section of my living room devoted to your masterpieces! Is that the new rule letting others to have more of Shane's puzzles!? Haha~Hope to meet you soon Kevin, and play with Shane's puzzles! Saturday comes very soon Otis and then the following Thursday at IPP! 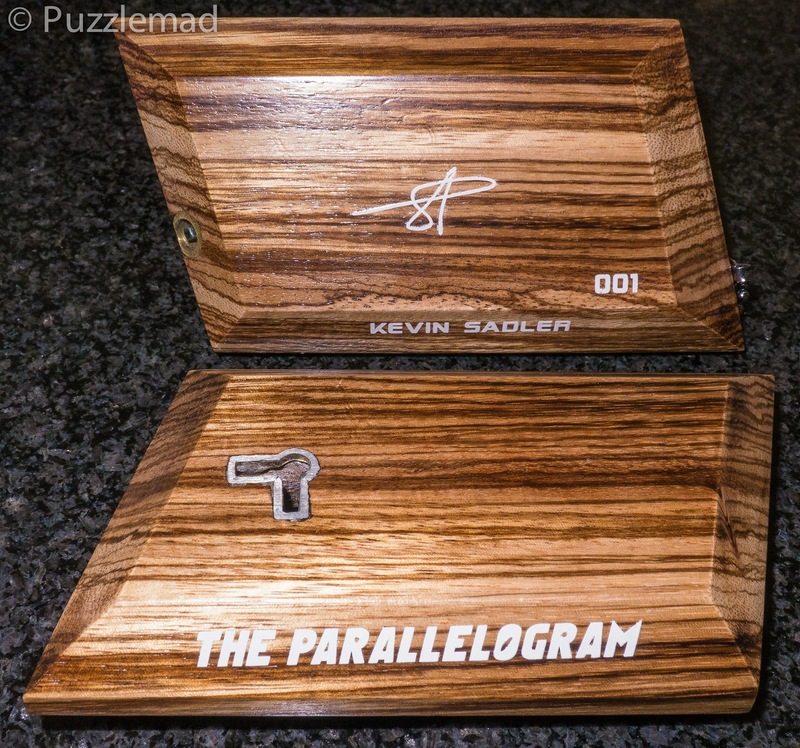 Kevin, you must let me see and touch the Parallelogram at IPP34 when we meet! Of course! I will be bringing it with me for all and sundry to try out!